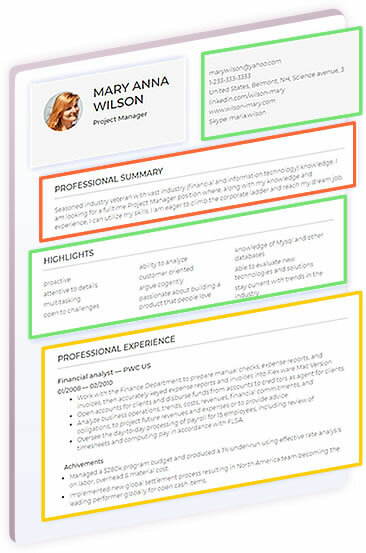 Let Artificial Intelligence check whether your resume is qualified enough, common resume-mistakes-free, passes Applicant Tracking System and get a feedback in a moment! Oops, we had a hard time analyzing your resume. 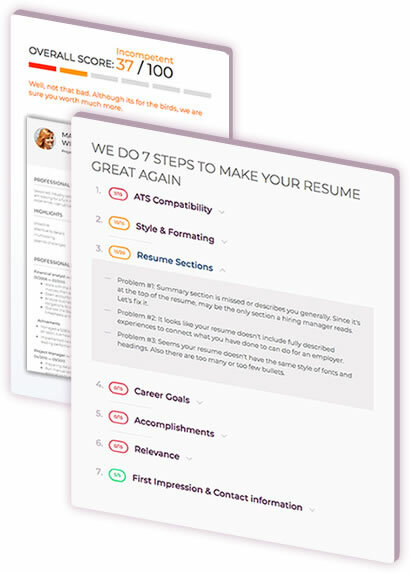 Please keep in mind that resumes with pictures, graphics, logos, or multiple columns can be incompatible with the kinds of computerized systems (ATS) companies usually use to store resumes. Take into consideration in this case, recruiters might not be able to see your resume. Lets try another file - simple, one-column format with clear headings and wording. Unless you know recruiter personally or have a direct recommendation, your resume is the only first and last chance to make a good impression and be invited for the next stage. Are you sure you would pass resume check? Does your resume have all the necessary sections and only strong action-oriented words are used? Are there no spelling errors and does the format provide a good overall aesthetic impression? Resumes pass AT system ATS algorithms used as a part of HR & Recruiting software scan resume and calculate score to find out if you match position. Use your only chance to impress recruiters. Good formatting, mistakes free resume, correct section titles make you a good job to land an interview. Find out typical resume mistakes job seekers usually make and check if you manage to avoid them and have more chances for an interview than others. 88% of employers use Applicant Tracking systems to run resume checker to filter candidates and select those who match position most. It’s critically important not only to avoid buzzwords, personal pronouns, passive voice, grammar and spelling mistakes. To ensure you will land an interview, describe properly your past experience and education, emphasize on tasks you have taken, indicate achievements and motivation. Select a resume and upload it into a system. Resume checker needs just 10 sec to screen a file. Go forward for the feedback and get resume score and an extended report with information what needs to be fixed. Each word of the resume gives a certain weight that creates negative or positive impression. Make sure your resume is professionally written and polished.